Pahranagat Valley's Jake Carter lifts up teammate Shawn Wadsworth as the Panthers celebrate winning the Division IV state championship. 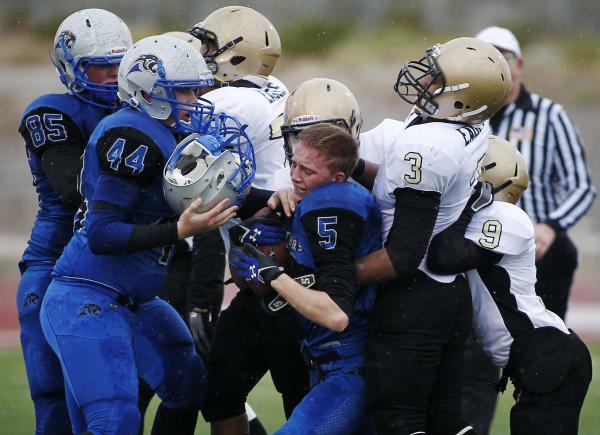 Pahranagat Valley's Wade Leavitt (5) is wrapped up as his helmet flies off and is caught by teammate Paden Higbee. Pahranagat Valley's Jordan Cryts dives with the ball as Spring Mountain's Arias Jefferson (23) pursues. 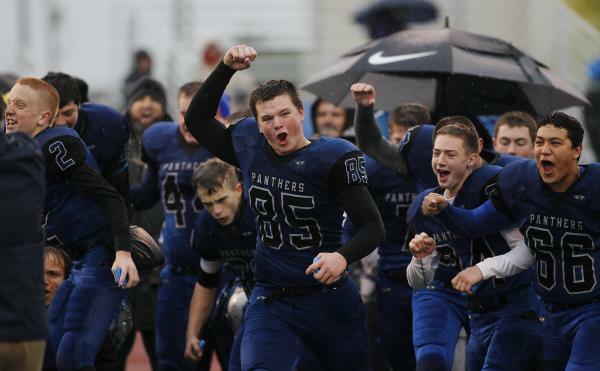 Pahranagat Valley's Jake Carter (85) leads his team in celebration as the Panthers win the Division IV state title. 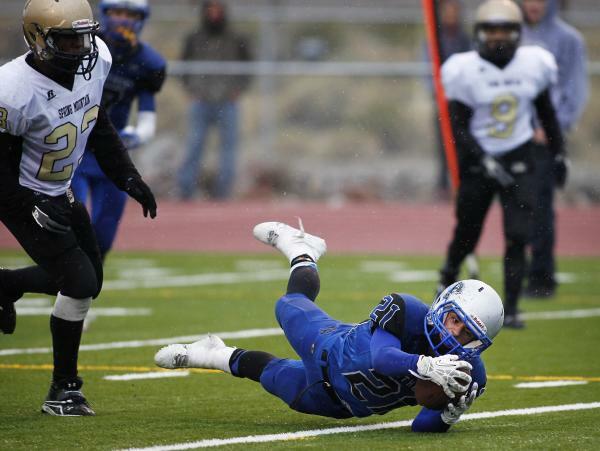 INDIAN SPRINGS — Pahranagat Valley’s football team hadn’t trailed in a game all year. 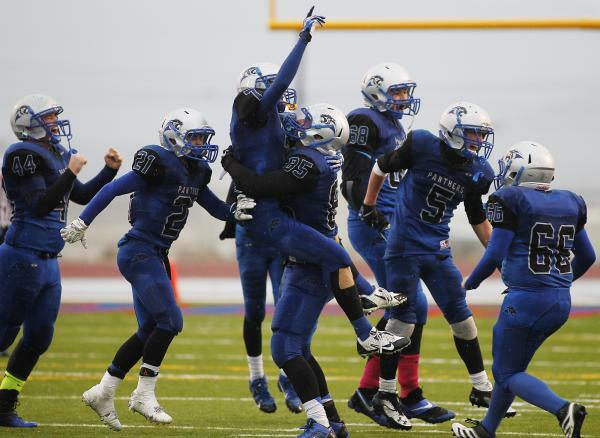 But in Saturday’s Division IV state championship game, the Panthers trailed Spring Mountain 8-6 at halftime. Pahranagat Valley scored the final 30 points to win its sixth straight title with a 36-8 victory over the Golden Eagles. The Panthers (12-0) lost a huge chunk of last year’s team and returned only two upperclassmen this year, so there was uncertainty entering the season. Two normally high-powered offenses were anything but potent early Saturday. The Panthers’ only score in the first half came on a 70-yard punt return by Jordan Cryts with 1 minute, 12 seconds left in the first quarter. Arias Jefferson set up the Golden Eagles’ first score when he intercepted a pass at the Pahranagat Valley 25-yard line with 1:10 in the second quarter. Joshua Banasiak scored on a 1-yard touchdown run with 33 seconds left. His 2-point conversion gave Spring Mountain its only lead of the game. Banasiak finished 11 of 24 for 116 yards passing for the Golden Eagles (7-3). Pahranagat Valley did just that. It was all downhill for Spring Mountain after it received the second-half kickoff and was quickly forced into a three-and-out. Despite having a punt return touchdown called back because of a penalty, Cryts ended up scoring on a 1-yard run to give the Panthers a 14-8 lead. Pahranagat Valley kept the ball on the ground thereafter, chewing up possession and getting scores. The Panthers finished with 182 yards rushing in the second half, primarily from Cryts and Wade Leavitt. Leavitt finished with 141 yards rushing, 73 yards receiving and two touchdowns. The Panthers will have the majority of their players coming back next year, and they can’t wait to keep the streak going.